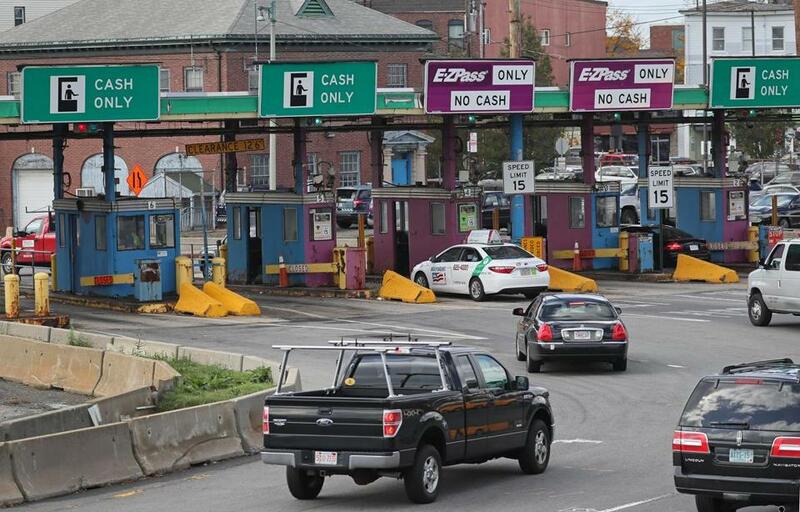 Did removing a toll plaza ruin East Boston’s roads? Morning traffic rush hour into the tunnel in East Boston. You know it’s bad when drivers are nostalgic for the days of the toll booth. At least that’s the case in East Boston, where endless traffic has residents and commuters lamenting the removal of the toll plaza from the mouth of the Sumner Tunnel. Getting into the tunnel is something of a daily crisis, with changing traffic patterns during construction confusing drivers and causing long backups on neighborhood streets, while a surge in volume has overwhelmed the road network. To be sure, traffic was often bad during the toll-booth era. But years of queueing for the eight pay lanes allowed veteran drivers to develop ways to navigate the familiar chaos. “It at least funneled the traffic the right way. Everybody took turns and you had to merge, but at least it flowed. People kind of made it fit,” said Clayton Mattos, who has commuted between East Boston and Cambridge for 25 years. The booths were removed in 2017 as part of the statewide switch to all-electronic tolling — a sea change that markedly improved traffic flow pretty much everywhere, it seems. But in East Boston, their removal coincided with a staggering increase in traffic, mostly attributed to the good economy, growth at Logan International Airport, and the rise of ride-hailing services such as Uber. East Boston side of the Sumner Tunnel toll booths. 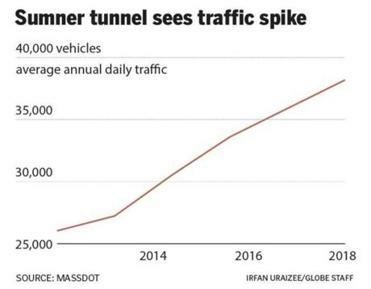 Some of the cause could be temporary: The Sumner approach remains a construction site, and the state has yet to complete the new traffic patterns feeding into the tunnel. However, officials believe the limitations of the two-lane tunnel are no match for the complex forces that have conspired to produce epic backups — whether there are toll booths or not. “It’s been a whole bunch of things coming together to make this area its own little microcosm of traffic issues in one place,” said the state’s highway administrator, Jonathan Gulliver. Preparing to remove the toll booths, the state in 2013 estimated that daily traffic into the Sumner would increase by 2.5 percent over five years, or into 2018. Officials were way off. In reality, traffic is up 47 percent, with 12,000 additional vehicle trips surging into the Sumner every day, pushing the daily average above 38,000. That spike comes even as ridership on the MBTA’s Blue Line — which also connects East Boston to downtown — grows. Why all the new cars? Unemployment is low, so more people are driving to work. Logan is busier than ever. Uber and Lyft are all over the streets — and, as of early 2017, at the airport. And population is up, in East Boston and along the North Shore. That growth, by the way, is unlikely to slow, with major residential projects pending in East Boston, Revere, and Lynn. “This is probably our biggest growth point in the entire state,” Gulliver said. State data also indicate that much of the traffic in East Boston is from nonresidents trying to short-circuit backups on Route 1A by cutting through the neighborhood. While 45 percent of vehicles entering the tunnel during the morning commute come from East Boston streets, only 20 percent of those are East Boston residents. Stunned by all the congestion, officials have made changes to the new approach to the Sumner since the toll booths were removed. 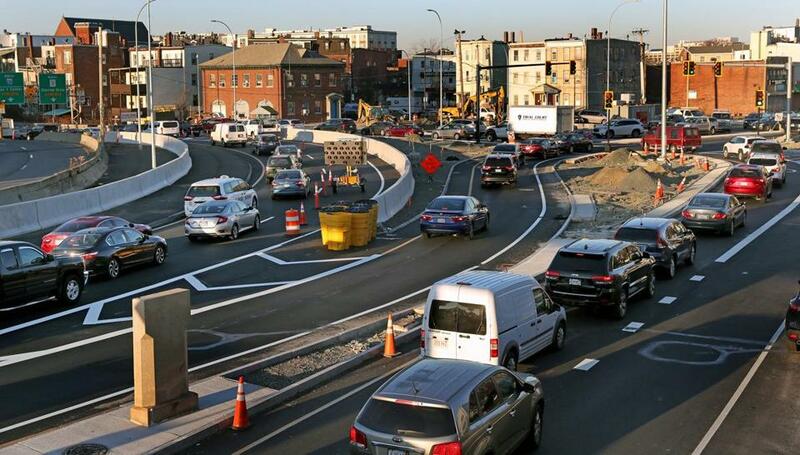 The initial design in 2017 funneled 1A down to one lane before the tunnel, while giving residential traffic from East Boston a lane of its own. That caused longer backups on the highway and probably prompted some of those drivers to take the local East Boston route. Gulliver said the approach “failed spectacularly,” and officials quickly scrapped the design. The new approach now being built provides more flexibility, by allowing the state to open and close lanes based on the time of day. In the morning, when traffic from local streets is much higher, cars entering from East Boston get their own access lane, while a lane coming from Route 1A is closed. In the afternoon, when traffic from East Boston is light, the lane opens to increase access from 1A, which also forces local traffic to merge before entering the tunnel. For now, the lane is blocked by barrels, but eventually a gate will swing open and closed to manage access. Some commuters say this hasn’t helped, and that a new traffic light has only made things worse. And while officials point out that the toll plaza had a high rate of accidents, drivers such as Michele Szabo Bell of Marblehead said the old system was worth the risk. “I suspect that the consensus of most commuters would be to accept the rare fender bender for a more efficient commute,” she said. Gulliver said construction work should be completed in weeks, which should help to ease congestion. Meanwhile, the state has also asked the Federal Highway Administration to help develop ideas for improvements. The biggest potential solution, Gulliver suggested, may come from miles away. The state is running a short test of a new traffic pattern on Storrow Drive that gives priority access to traffic coming from the Sumner Tunnel and Interstate 93. Though it confused some drivers initially, it has improved traffic flow from the Sumner onto Storrow, Gulliver said. Officials said the test will run another week before they decide whether to make the traffic pattern permanent. That could ripple all the way back to Route 1A on the other side of the Sumner, maybe even encouraging drivers to skip the “shortcut” through East Boston, thus improving conditions on neighborhood streets. On Thursday morning, while some streets closest to the tunnel were still backed up, traffic data showed that congestion had eased on more residential roads. Cathy Huban of East Boston said she has noticed an improvement since the new Storrow Drive design was implemented — though she wasn’t ready to celebrate. State Senator Joseph Boncore, who represents East Boston, said small road changes might help some but do not address the major problems brought on by such a sharp increase in traffic volume. He called for more radical changes, such as adjusting toll rates to discourage driving and expanding Blue Line service. “When we’re concentrating on design schemes we’re nibbling around the edges,” he said.